The BBC and ITV expect to launch their joint SVOD service BritBox in the UK in the second half of this year, after agreeing a joint vision for the service. BritBox is currently available in North America and the UK version of the service will offer British content alongside new BritBox originals, commissioned from UK production companies. Announcing the launch, the BBC and ITV said that they are now concluding talks and are working on a formal legal agreement for the service. They also said they anticipate other partners joining and will speak to regulators and the wider industry about their proposals. “I am really pleased that ITV and the BBC are at the concluding stage of discussions to launch a new streaming service,” said ITV CEO, Carolyn McCall. In its full-year results report, which was released today, ITV said that its net investment in BritBox will be up to £25 million in 2019, rising to around £40m million in 2020 and declining thereafter. ITV and the BBC’s commercial arm, then known as BBC Worldwide, first launched BritBox in the US in December 2016, billing it as an ad-free SVOD offering celebrating “the very best of British TV”. The joint venture partners each took a minority stake in the business, while AMC took a non-voting minority interest. BritBox rolled out to Canada in February 2018 and in January of this year the service reached half a million North American subscribers – marking a doubling of its user numbers year-on-year. The BBC and ITV said today that their success in North America shows that they have the know-how to launch and manage a streaming service. They added that research indicates “there is a real appetite for a new British streaming service – in addition to their current subscriptions”. 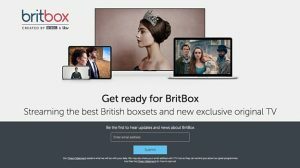 The BritBox UK expansion comes after Ofcom CEO Sharon White separately called on all the UK’s public broadcasters to launch a single digital platform during a conference speech last November. White said that a common digital platform, bringing together the content available on each of the PSB’s individual on-demand services – BBC iPlayer, ITV Hub, All 4 and My5 – would make it easier for viewers to access content across a range of devices with a single login.